I hope everyone is loving the season change and is settled into evenings of blankets, candles and box sets. I think our household is made for Autumn as we are total box set buffs and have watched too many to name, any recommendations would be massively appreciated to see us through the month, yes month! We get soo obsessed when we start we end up finishing a series in a week so I need a good few lined up! 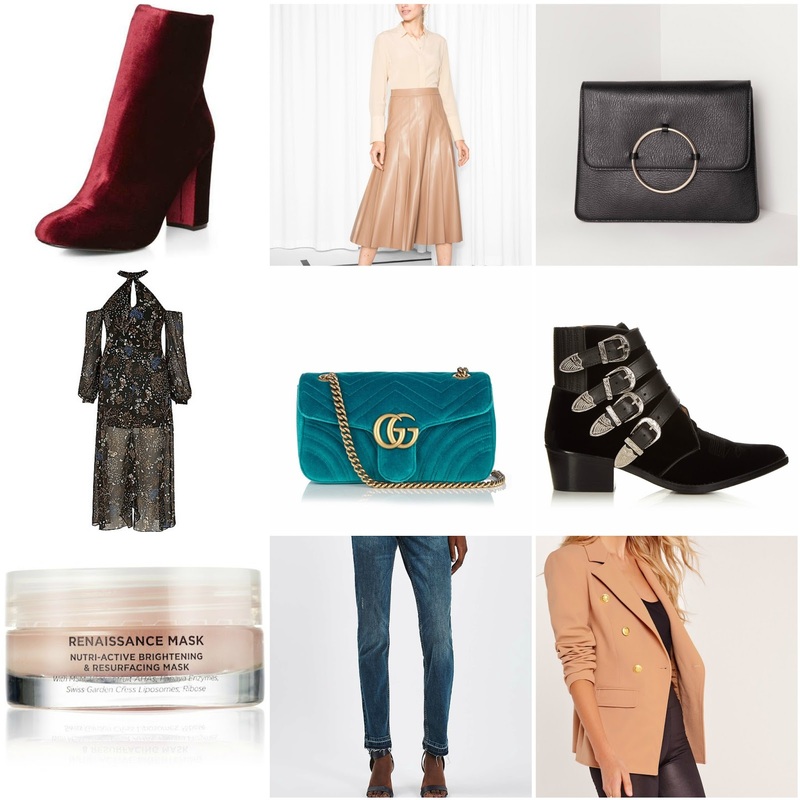 There are so many fab pieces on the highstreet at the moment I thought I would throw a few of my favourites into quick Autumn edit, with a splash of high end just for the wish list! While browsing the net I couldn’t help but notice how Missguided have managed to offer up some fab dupes to suppress our urge to wack out the credit card. I’m bloody loving this seasons it bag by J W Anderson but the pierced beauty is a tad out of my budget, luckily Misguided’s circle trim clutch fits the bill! What’s your fave piece that made my cut? Dorothy Perkins Red velvet boots £45 but for this week only get 25% off!! Missguided circle trim oversized clutch £22 – a nod to the J W Anderson pierced bag! Oskia Renaissance Mask £49.50 – I have been using this all week and I have really noticed a different in my hormonal skin and it smells amazing! Moto undone hem Baxter jeans £42 – will always be my favourite Topshop style as the denim is thick and holds me in! Missguided amazing Balmain blazer dupe for £35!! What’s your favourite piece from the edit? What will you be buying this Autumn? Previous Post its finally coat weather! !